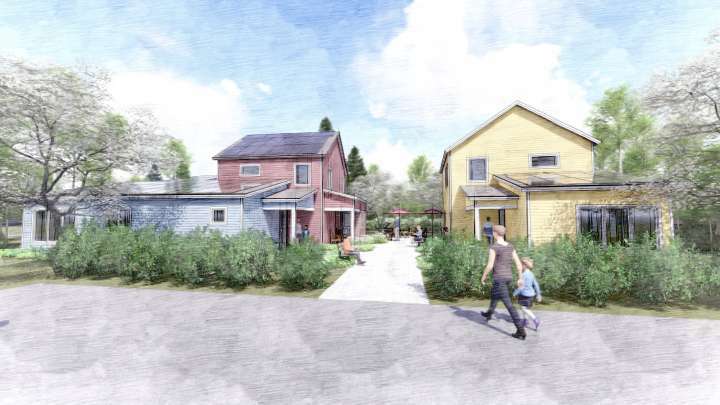 Our submission, The Space Between, is an expression of our experience in building affordable, net-zero homes. In our experience, limited budgets, constrained sites, and lofty efficiency goals catalyze exciting architecture and compelling spaces. 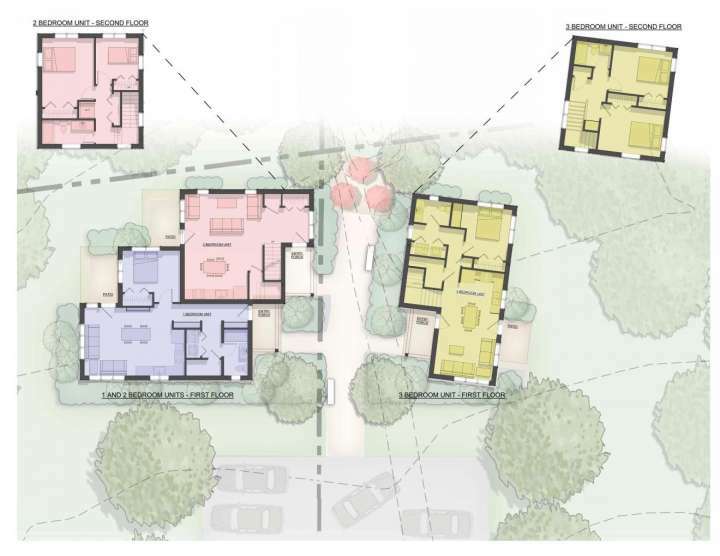 Our design begins with the existing site and the existing path to the conservation area located beyond this development. Rather than orient the buildings towards the parking or street, we took our queue from the existing foot path and oriented both the parking and the buildings along the pathway that currently runs through the site. 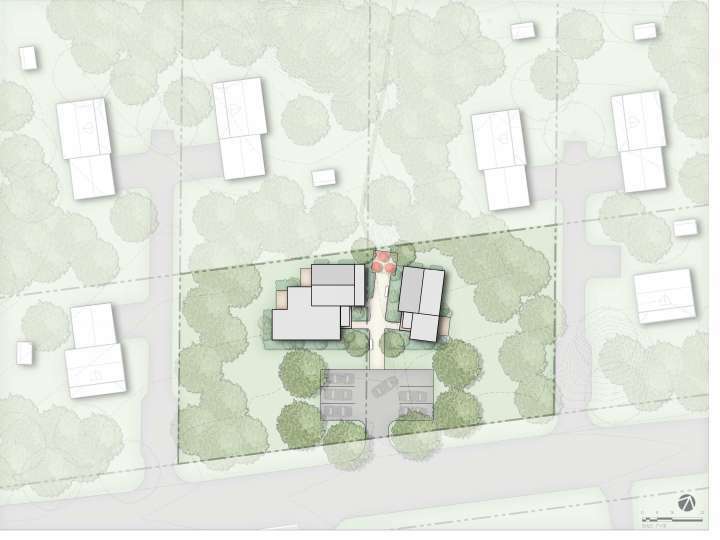 Orienting the entrances of the buildings towards each other instead of towards parking creates an place for community even on this sub-urban site. 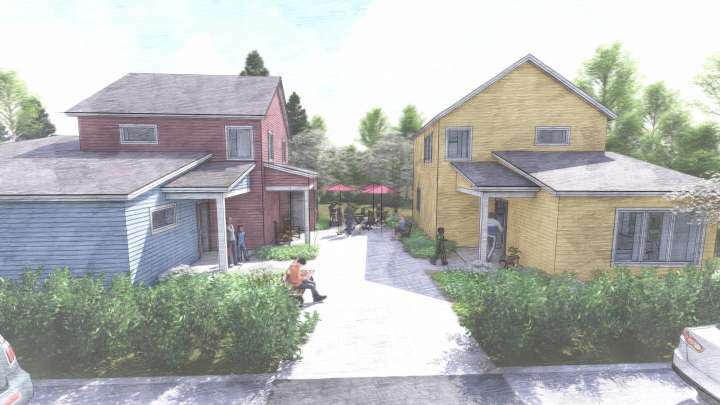 Neighborliness is a delicate balance between the commons and the private and these buildings are oriented to walk that fine line – entrances face the pathway, but bedrooms are placed away from the path. The path functions as common outdoor space, but all the units have private outdoor spaces located to the east and west, hidden from the path. Porches function as transition spaces between the common path and the private homes – if the pathway is the place to say ‘hello’ to a neighbor, the porch is the safe and comfortable place to say ‘goodbye’. Compacting the buildings on the site minimizes site disturbance and site work while also offering a convenient construction lay-down space, minimizing site development and construction costs. The building footprints are kept to a 2-foot module with each unit having one jog to adapt to the site and adjacent buildings. A notch at the top of the foundation wall is a cheap and easy way to isolate the interior slab from the exterior foundation, keeping heat inside and allowing the slab to become a massive heat sink, stabilizing temperatures throughout the year. Rigid insulation along the foundation walls further isolates the floor slab, creating a thermal buffer between the warm slab and the frozen ground. The envelopes of the buildings are 10” thick walls constructed with staggered 2x4s, creating super-efficient walls (R37) with simple, affordable, components available at any lumber yard. Dense-pack cellulose insulation combined with judicious use of spray foam and air-sealing details in areas susceptible to air-infiltration offers incredible warmth, while utilizing a tried-and-true, and readily available, job-site workflow. On the inside, the floor plans emphasize living spaces and double-duty spaces, hallways are also laundry rooms, spaces under stairways are also mechanical rooms. Additionally, utility work is minimized by short plumbing runs and stacked bathrooms. Finishes are simple, but functional, polishing brings out the beauty of the concrete slab that’s already been placed, gypsum wall board can be placed by volunteers and painting is sweat equity for the homeowner. Roofs are simple sheds and gables, ideal for straightforward raised-heel trusses; but, when your labor force is an unknown, flexibility is paramount, the roofs could also be stick-built with rafters as well. In order to simulate and study the building’s energy consumption, the highest impact factors for building heating and cooling loads were identified; they are shown in the chart to the right. Based on these factors, 4 different scenarios were defined to study the energy performance of the buildings. In each scenario, a single parameter was changed and the results were observed and tallied. The impact of each change on annual energy use, annual energy cost, and annual CO2 consumption are shown in the graph at the bottom center. 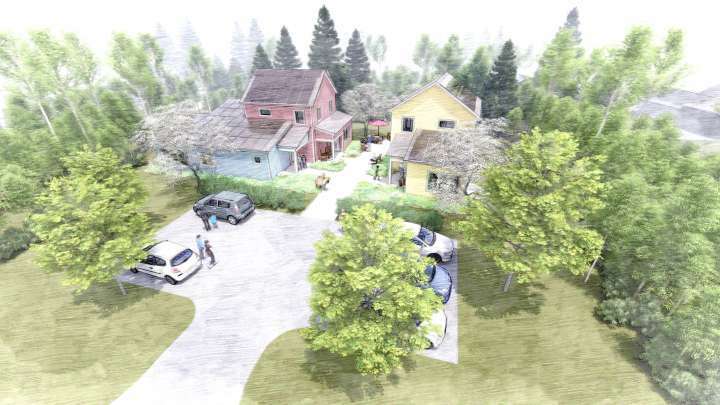 Ultimately, the project moved from a Baseline Scenario to the Final Design Scenario, where annual net zero energy use was achieved. Moving from the baseline code to our final design scenario was the result of wieghing the value of specific changes to the design and construction of the buildings. Our modeling results show that improving the envelope, the wall assembly, roof, and floor R-Values (as shown in table 1) will reduce electrical loads by 33%. Higher performance glazing, with lower U-Values and conductivity, will provide another 6% reduction to overall energy consumption. Changing the HVAC system to a ductless split system will reduce loads by an additional 22% and lighting power density reduction through high efficiency lighting will contribute another 5% reduction to electrical loads. By combining all these reductions we will improve the energy usage of the three units by 66% over the baseline standard. Considering 1,500 SF available on south-facing roofs for PV, the project will reach a net positive level and generate higher amount of solar PV electricity than its annual energy consumption. Thom Barry Volunteers to Facilitate LEGO Architecture gathering.